Many are familiar with the popular omega-3 fatty acid found in fish oil, but few have heard of omega-6. So, what is omega-6, and is it good for you? 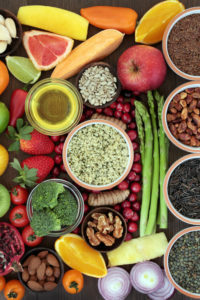 We should get double the amount of omega-3 fatty acids than omega-6 fatty acids, so go easy on popular cooking oils, including corn, safflower, peanut, soybean, cottonseed, sesame, and sunflower, in which omega-6s are abundant. 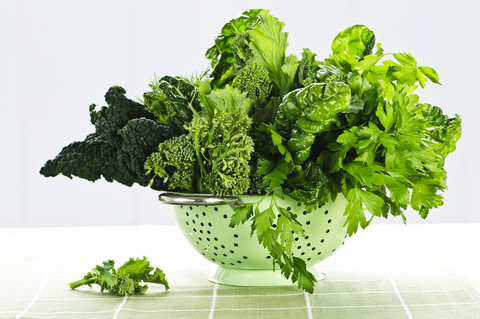 On the other hand, leafy green vegetables are a great source of omega-6s. Not all fats are created equal: Saturated vs unsaturated. Essential vs unessential. Healthy vs unhealthy. The hard part is knowing which fats are good for you and which you should avoid. Along those lines, let’s compare omega-3 fatty acids to omega-6 fatty acids, with an eye toward balance. Both omega-6 and omega-3 fatty acids are considered PUFAs: polyunsaturated fats. Chemically, PUFAs are simply fat molecules; they are typically liquid at room temperature but start to turn solid when chilled. PUFAs are much healthier to consume than saturated fats or trans fats because they can help reduce bad cholesterol levels, which in turn lowers your risk of heart disease and stroke. Furthermore, like omega 3s, omega-6s are considered “essential” fatty acids. That is, the human body requires them for good health, yet cannot make them on their own. Both omega-3 and omega-6 are important in the normal functioning of all tissues in the body. Is Omega-6 Good for You? Omega-6 fatty acids are found in leafy vegetables, seeds, nuts, grains, and vegetable oils. They stimulate skin and hair growth, maintain bone health, regulate metabolism, and maintain the reproductive system. When properly balanced with omega-3s, omega-6s are excellent for your health. In particular, consuming the omega-6 fatty acid GLA (gamma-linolenic acid) has been shown to have positive health benefits. GLA is abundant in rare oils such as black current, the herb borage, and hemp oil. Once ingested, GLA is converted to a substance called DGLA that fights inflammation. Helps patients with arthritis by reducing symptoms and the need to take NSAIDs (non-steroidal anti-inflammatory drugs). Is commonly used for treating skin conditions such as systemic sclerosis, psoriasis, and eczema. Improves symptoms and reduces inflammation in certain eye conditions. In diabetics, helps diabetic neuropathy by improving nerve conduction velocity leading to improved blood flow and reduce tingling of the lower extremities. Improves gaseous exchange in patients with acute lung injury. In breast cancer patients, improves the effectiveness of tamoxifen, reduces side effects, and increases the therapeutic response. Reduces menopausal symptoms of hot flashes as well as decreases PMS symptoms. The reaction of GLA to DGLA is very slow and can be restricted by alcohol use, stress, smoking, saturated and trans-fatty acid intake, and deficiencies of magnesium, vitamin B6, and zinc. Thus, consuming GLA supplements along with certain nutrients (including magnesium, zinc, and vitamins C, B3, and B6) will help promote the conversion of GLA to DGLA. GLA supplements in the form of black currant oil and borage oil are often delivered in gel caps. Additionally, spirulina (often called blue green algae) contains GLA. Be sure to speak to your physician to determine the most effective dose for your condition. Despite the health benefits of GLA, most other omega-6 fatty acids are actually pro-inflammatory, meaning they can have a deleterious health effect by promoting inflammation in the body. And, chronic inflammation has been linked to a plethora of chronic illnesses including diabetes, heart disease, Alzheimer’s disease, and cancer, to name a few. Most Americans consume far too many omega-6 vs. omega-3 fatty acids because they’re abundant in popular cooking oils, including corn, safflower, peanut, soybean, cottonseed, sesame, and sunflower. Having this overabundance of omega-6 fatty acids actually does us harm, promoting inflammation instead of decreasing it. To counteract this, omega-6s must be regulated by the anti-inflammatory omega-3 fatty acids. In one study, researchers hypothesized that the over-consumption of omega-6 fatty acids to omega-3 fatty acids has paralleled the significant increase in the prevalence of overweight and obese adults. The researchers noted that in the past three decades, the intake of omega-6 fatty acids in the Western diet has increased, while the intake of omega-3 fatty acids has decreased. The result: a ratio of as much as 20:1 (or even higher) in the consumption of omega-6 vs. omega-3. The researchers emphasized the key to reversing the obesity epidemic is to promote a proper fatty acid ratio balance. Thus, the real take-away here is to make sure you’re getting the proper ratio of omega-3s to omega-6s in your diet. Researchers agree that the optimal omega ratio should be between 2:1 to 4:1. That is, you should consume at least double the amount of omega-3s compared to other fats. The idea is to eat just enough omega-6s to function, but no more, and to balance them with lots of healthy omega-3s. Omega 6-fatty acids. Retrieved Oct 2017 from University of Maryland Medical System. Curr Pharm Biotechnol. 2006 Dec;7(6):531-4. Nutrients. 2016 Mar; 8(3): 128. Essential Fatty Acids. Retrieved Oct 2017 from Linus Pauling Institute: Oregon State University. alcohol, alzheimer, anti inflammatory, anti inflammatory drugs, arthritis, bad cholesterol, bad cholesterol levels, blood pressure, bone, bone density, bone health, bone loss, breast cancer, cancer, cholesterol, cholesterol levels, chronic inflammation, cooking, corn, diabetes, diabetes heart disease, diabetic, diabetic neuropathy, diabetics, diet, eczema, eye conditions, good health, health, health news, heart disease, high blood pressure, hot flashes, inflammation, magnesium, menopausal, metabolism, non steroidal anti inflammatory drugs, nsaids, nutrients, nuts, obesity, obesity epidemic, omega 3, omega 3 fatty acids, omega 3s, omega 6, omega 9, omega 9 benefits, osteoporosis, osteoporosis 3, pms, psoriasis, risk of heart disease, side effects, skin, smoking, stress, stroke, supplements, t score, university health news, vegetables, vitamin, vitamin b6, vitamins, western diet, zinc. If you want treatment for Chronic obstructive pulmonary disease (COPD) kindly email totalcureherbalfoundation@ gmail. com because they helped my stepmother,she was at the point she almost lost her life because she was at the end stage,our doctor said the copd cannot be cured yet she still believed that something must be done,i decided to come on-line if there will be better solution so i met this health clinic on-line which i decided to give a try,i can assure you that my stepmother is fully free from copd disease with the herbal remedies they sent to me,please if there is anybody who is diagnosed do not hesitate to email them or if there is anybody that needs help kindly forward this testimony.